Levels of income, consumer expenditure and their structure display significant disproportions between areas of different degrees of urbanisation. These disproportions are reflected both in the objective comparison and subjectively perceived material situation of households. This study contains an assessment of the differences in income and consumption in rural areas and cities of Poland at a national level and in relation to the Subcarpathian Province, as a less developed region. The results of public statistic surveys were supplemented with the results of own research regarding the perception of the situation by the inhabitants of Subcarpathia. The scale of existing socio-economic disproportion in spatial layout and directions of changes in accordance to objective and subjective indicators were identified. The changes in the value of purchases of various types of products, levels of savings and living conditions were addressed. 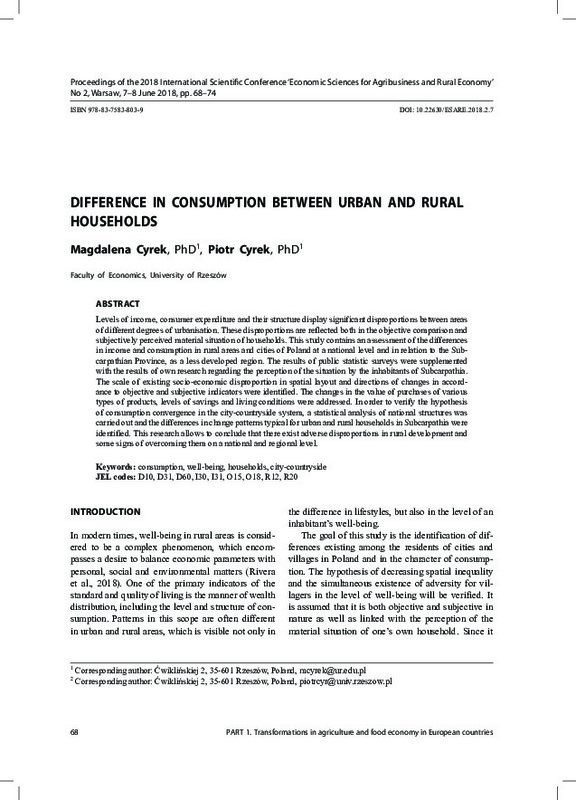 In order to verify the hypothesis of consumption convergence in the city-countryside system, a statistical analysis of national structures was carried out and the differences in change patterns typical for urban and rural households in Subcarpathia were identified. This research allows to conclude that there exist adverse disproportions in rural development and some signs of overcoming them on a national and regional level.